Where do the bees sleep? Metal Gear Solid V: The Phantom Pain (メタルギアソリッドV ザ・ファントム・ペイン, Metaru Gia Soriddo Faibu Za Fantomu Pein?) is an open world action-adventure stealth video game developed by Kojima Productions and directed, co-produced and co-written by Hideo Kojima, for Microsoft Windows, PlayStation 3, PlayStation 4, Xbox 360 and Xbox One. 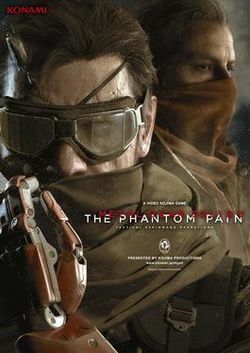 The game is a continuation of the events of Metal Gear Solid V: Ground Zeroes, and carries over the same tagline of Tactical Espionage Operations first used in Metal Gear Solid: Peace Walker. The game follows the mercenary leader Venom Snake as he ventures into Africa and Afghanistan during the Soviet war in Afghanistan to exact revenge on the people who destroyed his forces during the events of Ground Zeroes. This page was last edited on 10 July 2016, at 03:28.